Your mother hollers that you're going to miss the bus. She can see it coming down the street. You don't stop and hug her and tell her you love her. You don't thank her for being a good, kind, patient mother. Of course not--you launch yourself down the stairs and make a run for the corner. 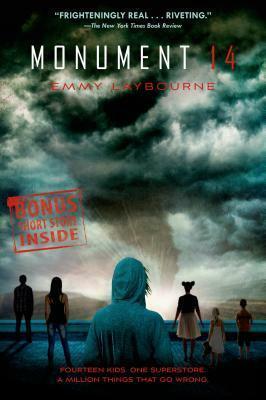 In Emmy Laybourne's action-packed debut novel Monument 14, six high school kids (some popular, some not), two eighth graders (one a tech genius), and six little kids trapped together in a chain superstore build a refuge for themselves inside. While outside, a series of escalating disasters, beginning with a monster hailstorm and ending with a chemical weapons spill, seems to be tearing the world--as they know it--apart. EMMY LAYBOURNE is a novelist, teacher, and former character actress. Emmy's Monument 14 trilogy has earned critical praise ("Frighteningly real... riveting" - New York Times Book Review, Editor's Choice) and has been nominated by readers to the YALSA Teens Top Ten in 2013 and 2014.Before her life as an author, Emmy performed original comedy on Comedy Central, MTV, and VH1; and acted in the movies Superstar, The In-Laws, and Nancy Drew, among others. Emmy lives outside New York City with her husband, two kids, and a flock of 8 nifty chickens.